Classic Line anti-cellulite shorts smooth and sculpt your body, with a draining action that targets your thighs, bottom and hips to reduce and prevent that unattractive orange peel effect. 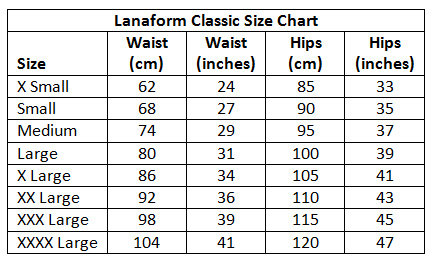 Lanaform’s ‘Slimming Fabrics’ range uses the movement of your body to activate its fat reducing action. It prevents and eliminates cellulite with a winning combination of constant micro-massage, heat and moisture that boosts your body’s drainage systems. Lanaform’s Slimming Fabrics range is thin and light with excellent elasticity, so you’ll feel super comfortable as well as looking great. The fabric is made of three layers: a polyester outer, latex layer and cotton inner lining. This creates a warming, massaging effect that increases the circulation of your blood and your lymphatic drainage. As a result, the excess water in your body will be drained off and that horrible bloated feeling will be a distant memory! The micro massage also rejuvenates skin, making it smoother, firmer and softer for an overall glowing and healthy appearance. A laboratory study of these Classic slimming shorts found that after 28 days of wear the participant’s thigh measurements had reduced by up to 7cm (2.75 inches). Try wearing yours for a month and see the amazing results for yourself! The shorts are machine washable for easy maintenance. The beige colour makes them easy to wear under dresses, skirts or trousers without anyone knowing that they’re there. The contouring effect of the reinforced waist panel will make all your clothes look amazing, as you achieve a perfectly smooth hourglass figure. Slimming the thighs, hips and waist and reducing cellulite. Outer: 100% polyester / Lining: 100% cotton / Reinforced gusset: 85% polyamide 15%elastane / Reinforced waist: 100% polyester. Contains latex.